‘Design consultancy’ is a somewhat dry term for what we do. But it’s about right. People come and talk to me about how their business might improve its communications. We then consult – which essentially means an initial conversation ensuring we’re talking our client’s visual and verbal language. But when I meet someone who themselves runs a consultancy we’ve immediately got even more to discuss. There’s an understanding, if you will, of the service we are offering. Interestingly we’ve been doing a fair amount of this kind of work lately. Earlier this summer we worked on a brand and website project for financial services management consultancy AlgoMe. 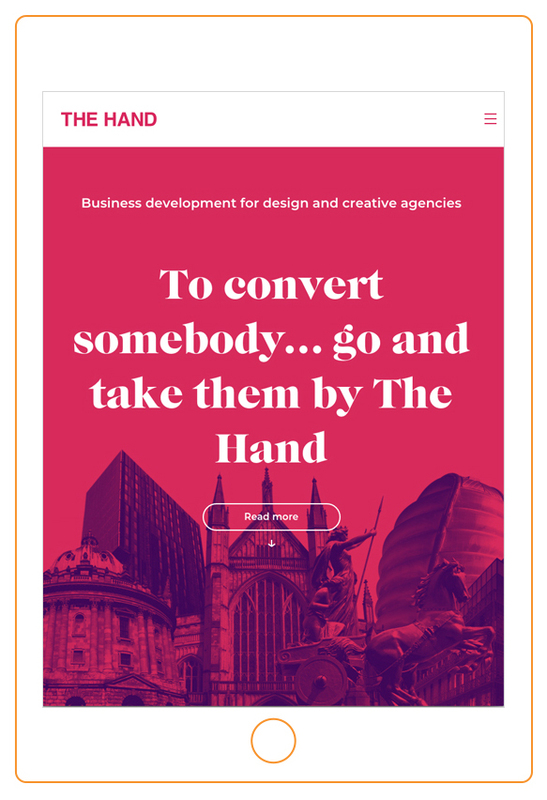 Then this week we’ve completed a brand review and website redesign for The Hand – who offer business mentoring and lead generation for creative consultancies. Both of these are great examples of our work providing brand and web design for consulting businesses. Before you talk to a prospective client comes a very early judging of the book (or in this case brand) by its cover. Even a consultancy working in a super-corporate arena such as high-finance or the legal sector needs to stand out with clean graphic design. But more of that later. Ultimately a good consultant knows their opinion is stock in trade – so I’d always suggest putting a unique tone of voice, crisply presented, front and centre in all your communications. I so often see great ideas and vision presented amid a dense load of waffle. Be brutal and save the get-to-know-you type conversations for the meetings. As someone who runs a personality-led business, I have often wondered if this was the right approach. Surely a short, zippy name might work better? It turns out – not always. It’s something I’m familiar with. I’ve always found to my surprise that my team prefer it and clients do too. They also understand (and like) the fact that I employ people with strengths beyond my own to round out our offering. Another common trait that consultancies seem to have time and time again is to talk about themselves and their ‘unique approach’ right away. That’s all valid in its place but ignores (and puts off) clients who just want to see their concerns addressed with an understanding of their immediate needs. This can then be effectively followed up with information about how you can service those to really make a difference to their bottom line. You’re not looking much at your website (who does? ), but your clients will. I often hear from consultancies who claim that as all their business is from referrals, investing in their online presence is a waste of time and money. Then, when they finally do agree to big revamp are astonished at the calls they get offering congratulations. It turns out that even your oldest clients are watching – sometimes just because they can’t find your number. “We just don’t have time to do the website right now…” goes a familiar refrain. But, take my word for it, redesigning a website just requires a good brief – then your sign-off on the presented layouts. We’re doing the heavy lifting here! With the combination of a great design team and copywriter – plus an additional creative like an illustrator or photographer. You’ll be online and back in (serious) business in no time. A great case study that ticks all these boxes is a project we’ve just completed for The Hand, a consultancy who work primarily with creative agencies in the design, marketing and advertising sector. A Design Business Association-certified consultancy with a great track record, The Hand needed a website which felt confident and vivid. A clear statement of understanding of the marketplace in which they work. Following meetings with Managing Director Natasha Ellard-Shoefield, we knew the kind of bold visuals she was looking for. Central to the brief was to include landmarks from the cities where The Hand has clients. Without some sort of twist, visuals of this kind can run the risk of being a little generic. We utilised the brand’s gutsy hot pink primary brand colour and paired it with a rich purple. 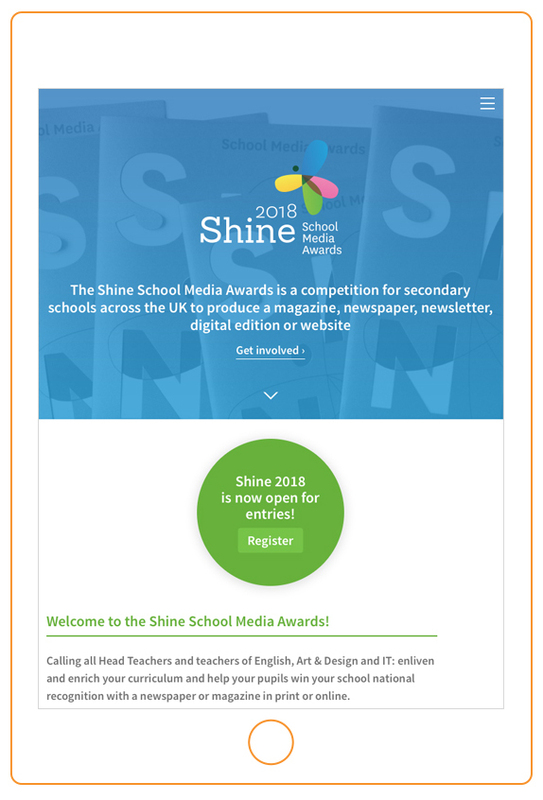 I’m so thrilled at the outcome here – the combination of what could be a corporate subject matter paired with these deep, rich colours creates and defines an outstanding website. We’ve tied this together using a bold serif typeface as our primary header. Every single word on the site has been scrutinised with a view to communicating how skills of The Hand can provide an outstanding service, then presented in the clearest possible way. It’s an unusual, striking and effective site for a specialist consultancy who work in a creative field. Do you run a management consultancy? We’d love to hear from you and collaborate. There’s more information about our work for The Hand below – or just give me a call on 020 7351 4083.